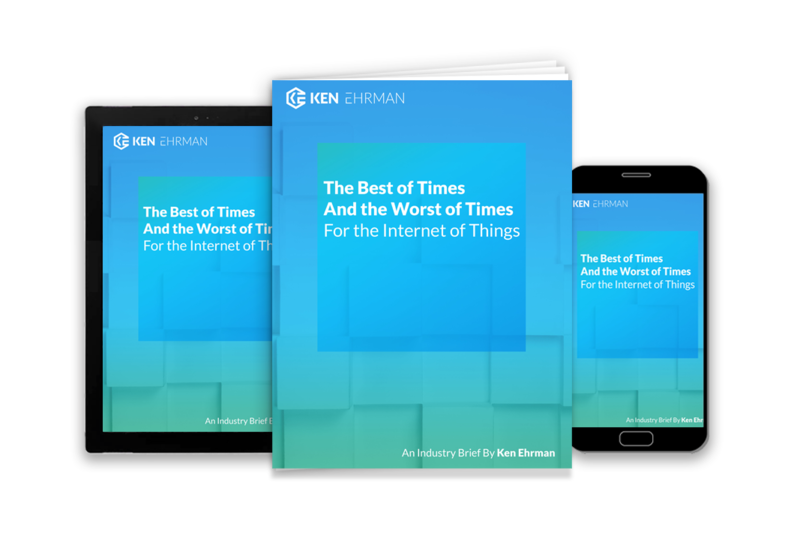 The Ehrman LIST series aims to provide insights and advice on how to accelerate revenue and earnings with regard to the Logistics, IoT, Supply Chain & Transportation industries. As a small to midsize Internet of Things (IoT) provider, landing a Fortune 100 company as your client is a huge undertaking with potentially massive benefits for your company’s earnings. F100 customers are large—meaning that they have much to gain from understanding how best to use their assets, where their high-value assets are, and how they can generate more revenue with an Industrial Internet of Things (IIoT) solution. You may be inclined to think that the Giants will only seek out solutions from other Giants. After all, large corporations may have already established relationships with other giant companies. However, as the IoT continues to surge in popularity, we’ll continue to see more opportunities for small to midsize companies. Smaller companies are often agile and nimble, and you may have a more up-to-date IoT solution in comparison with your Giant competitor. Experts like Peter Bowen, a partner at Bain & Company, are specifically urging the giants of industry to adopt technologies from small companies—arguing that, “smaller platforms…often have better traction in the market, especially when it comes to addressing specialized use cases and niche applications of IoT” (Violino). With influencers suggesting that the best solutions can sometimes fly under-the-radar, large companies will be looking for unique solutions from unexpected providers. As a result, you need to be ready to work with the giants of your target industry. 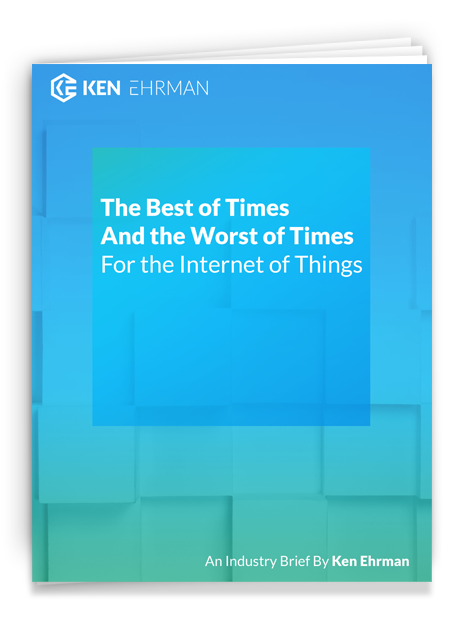 The timing has never been better to become one of the big-league Industrial IoT providers. 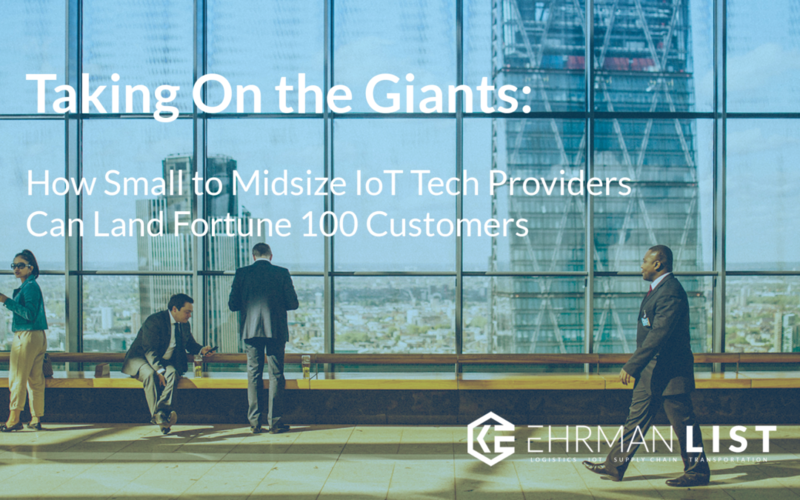 Being ready for the coming years of IoT adoption can create huge results for your tech company, because what’s comparatively small for a giant F100 company is going to be a large revenue increase for a small to midsize tech provider. On top of the potential for expensive orders, an initial successful installation of your technology can prove your value proposition, support the idea that the ROI is there for your large F100 customer, and—most importantly—create the potential for follow-on orders. For example, I was able to facilitate a 50,000 unit IoT device order fairly recently with Avis rental car on behalf of I.D. Systems. This represents only 10% of Avis’s entire fleet size, meaning that as I.D. Systems continues with the contract, their successful rollout of the solution can result in a 10-fold increase in revenue if Avis decides to adopt the technology throughout their whole fleet. For the reasons listed above, working with the Giants at the F100 level is appealing, to say the least. You should know, though, that they’re the most demanding customers in the world. They expect everything to work, and they expect it to work flawlessly. Any data anomalies will be scrutinized thoroughly. Because things scale quickly with big enterprises, a small issue can result in huge expenses across a large company. In addition, the employee count, hierarchy and associated pressures can impact your technology solution. The champion that you may have a relationship with can potentially have hundreds of company employees who work below or above that individual (if it works right, potentially thousands could be impacted in other departments of the company). They may be resistant to change or have established methods that don’t integrate well with your solution. It’s important to know that these are influences you’ll have to overcome when selling your solution to a company on a giant scale. As you embrace and install the latest and greatest technologies for F100 companies, these influencers could potentially be a roadblock. In my experience, pursuing F100 companies ultimately pays off in a big way. After founding I.D. Systems, we had various projects that grew from several hundred thousand to tens of millions of dollars because of the sheer size of these F100 companies, and the value we brought to an operation of that scale. First and foremost, you need to find a champion for your technology. If you don’t have a champion in one of these large organizations, you don’t have much of a chance. You can spend months or years trying out cold selling, but getting nowhere. You need to find someone within the organization who wants to make a difference, make an impression within the company, and specifically someone who wants to buy from you more than you want to sell to them. This will put you on the path to signing F100 companies and achieving success. The second step is to install a pilot. This is hugely important, because it means that you build trust while being able to scale your solution safely. Back when I.D Systems started, I used this pilot method to gain Ford Motor Company as one of our initial customers. To catch their attention, I sent a one-page fax to Ford Motor Company, inquiring whether they might have any interest in trying a pilot (without requiring payment), to ensure that our solution has the capabilities necessary to meet the requirements for a company of Ford’s size to track, monitor and control their forklift fleets. This piqued their interest, because there were many potential benefits and very few risks. From this humble one-page fax, we quickly received a response from the Advanced Technology Manufacturing Division of Ford, saying that they were indeed interested in implementing a pilot. They participated in our trial, and actually covered our expenses. We secured their eventual buy-in by building trust and confidence in our technology. They became one of our first commercial customers, and decided to purchase the solution for their largest facility in Detroit, MI. It’s very important to determine the ROI up-front. Don’t fall into the trap of offering free pilots without first specifically identifying and determining the key measures of success. Don’t be afraid to ask what those measures of success are, and don’t be afraid to ask what happens if you are successful. You need to make sure that these customers understand the value proposition, and how it can be tailored to them. Asking those questions shouldn’t be met with resistance, because they’ll want to identify those milestones and challenges as much as you do. Failing to establish the success criteria can be detrimental to your technology company for various reasons. You, as the provider, may be delivering great pilot results, but without a solid understanding and agreement between both parties, the customer may not be seeing exactly what they’d hoped for. Alternatively, your pilot can exceed expectations. Failing to set the expectations puts your customer in an advantageous position because your success can set an unrealistic baseline for negotiations, and you might not know how your solution truly measures up against the expectations of big clients. Rather than having the customer set your expectations, you are setting theirs. If you overachieve in this instance, you might not be rewarded as well because they would view this high bar you’ve set as the standard. This can cause additional purchases to stall for months or years. Identify the success criteria, then make sure you feel comfortable with the measurements as well as the stakeholders’ goals. When does the budget get approved and what does the budget cycle look like? Can you meet with the decision makers? This is extremely important, because decision-makers will often have questions that your champion can’t answer. It’s very important that your champion understands that you’re a team that needs to work together, and allows you to participate when possible in approval meetings. Make sure that the success criteria are important to the decision-maker as well. Confirm that your champion and the gatekeeper are on the same page. If you want to do business with F100 companies, you need to determine what the success might mean in order to put you on the best path to progressing your business and providing solutions to the largest potential users of your offering. Make sure you do meet or exceed expectations. Do NOT say it will take 3 months to install the pilot but then take 6 months. This puts your champion at significant risk. You need to create trust in the relationship, make sure that your company can make agreements, keep those promises to create a successful partnership from the start. For example, we received an order from Home Depot to install in 4 distribution centers fairly early on. Once that was completed, we would use that as a measure for success to move on to their remaining 120 centers. At that time, it took us almost a year to install 4 distribution centers, because we didn’t have the means to prioritize Home Depot over our many other customers who had more pressing concerns. At the end of the first year, our champion (who was initially extremely committed and enthusiastic) had to take a step back and reevaluate the benefits, because at the previously established rate, it would take 30 years to roll out the solution to all distribution centers. So, make sure to take all of your other pilots and contracts into account before committing to something. Installing in 4 distribution centers may have been reasonable on its own, but in light of our other commitments, we had prioritization issues that we learned to anticipate in order to properly meet or exceed expectations. This could have been avoided effectively when establishing the scope of our project. For example, when determining the scope of a pilot, guiding your customers’ expectations makes all the difference. Qualify your claims. Make commitments and keep them. One of the best justifications for your value proposition is that your F100 customer won’t be able to find a solution like yours anywhere else. You must have a unique technology if you’re in the internet of things business. If you don’t already have patents, make sure you have patents pending. Submitting patents is well worth the benefits. Identify where your technology is unique and then patent the solution. These are some of the most important elements that are involved in working with the giants and F100 companies. Make sure you keep them in mind whenever you move forward with a potential client, but especially in high-stakes scenarios where securing customer confidence can result in tens of millions of dollars in additional revenue over time. For more like this, subscribe below for my Ehrman LIST, where I bring you essential content, insights, and information regarding Logistics, IoT, Supply Chain, & Transportation. I’ll be bringing you helpful information designed to put you in the path of success when it comes to Industrial IoT and emerging technologies, and keeping you up-to-date with news and resources. Having experience or guidance in both the IoT technologies themselves and the industries that use them will be the key to remaining or becoming competitive during the current IoT boom. Always be in-the-know, with regular updates that provide the best tools to keep your company’s solutions on the cutting edge. For direct inquiries, feel free to send a direct message via Twitter or LinkedIn, or you can contact me at ken@kenehrman.com. Violino, Bob. “Businesses Prepare for the Coming IoT Battleground.” ZDNet, 26 Oct. 2017, www.zdnet.com/article/businesses-prepare-for-the-coming-iot-battleground/.